Easy View allows you to define and save a scan definition so you can reuse it. The Run Scan Definition (EZSCAN) command uses this saved scan definition to scan and replace from a command line or in batch. This procedure describes how to create a scan definition and use the EZSCAN command. Press F6, Add Group, to define a new group. Enter a name and description for the group in the Add Group window and press Enter. The new group name displays on the Work with Journal Groups panel. Enter option 1, Work with files, next to the new group name to display the Work with Files in Group panel. Press F6, Add File, to add a file to the group. Enter the name of the file and the library where it is found in the Add file to Group window. The Work with Files in Group panel displays again with the file name. Enter option 6, Edit Scan, for file, next to the file. The Work with Search Criteria in File panel displays. Press function key 6, Add Search. The Add View window displays allowing you to enter a name and description for the new search. Press Enter to display the Maintain Search Criterion panel. Enter your scan/replace criteria. When you’ve finished entering your scan/replace criteria, press F8, Create/Change Search. This saves your scan definition; it displays on the Work with Search Criteria in File. You now can use the saved scan definition in the EZSCAN command. Note: You can create and save as many scan definitions as necessary, making them available to be reused as needed. You can also export the results of a scan to a new or existing file. 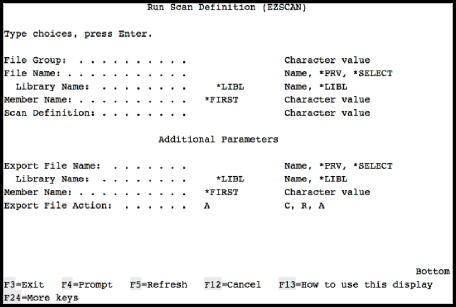 Enter EZSCAN in a command line and press F4 to display the Run Scan Definition (EZSCAN) panel. Press F10 to display additional parameters. C Create a new file containing the selected records. A Add this record to an existing file. Adds records from scan results to existing files. You can modify a scan definition at any time. Enter option 1, Work with Files, in the Opt column next to the group that contains the scan definition you want to change. The Work with Files in Group panel displays listing the files that have been added to the group. Locate the file whose scan definition you want to modify. Enter option 6, Edit Scan for file, next to the file. The Work with Search Criteria in File panel displays with a list of all scan definitions that have been saved. Enter option 2, Change Search Definition, next to the scan definition you want to modify. The Maintain Search Criterion panel displays. Modify the scan as needed and press F8, Create/Change Search, to save your changes.